Published August 25, 2011 By Anna T. This post may contain affiliate links. Regardless, I only recommend sites I've researched and/or used and trust. On RealWaystoEarn, I like to sometimes share outside-the-home jobs that offer flexible, independent work. Jobs like this are definitely worthy of mention here. For example, mystery shopping is one that I have already covered a little, but today I want to talk to you about working as a product merchandiser. Has anyone at Sam's Club, Target, or Walmart ever asked you to sample a product? Have you ever seen someone stocking shelves, setting up magazines, or arranging signs for display? You might have initially believed these people were store employees. But they're not. These people are product merchandisers. Product manufacturers typically hire merchandisers to set up displays and signs, offer samples, perform demonstrations, and handle merchandising resets. Why should merchandising jobs be of interest to people who want to work from home? Merchandising may be of interest because people who want to work from home tend to desire flexible schedules. While merchandising requires you to leave your home, it does typically offer flexibility and independence. Keep in mind that the flexibility may depend on the company or companies you're with. Some companies may offer a flexible schedule, while others might require you to work on certain days. Related: Drive on your own time delivering food orders from your car, bike, or scooter and earn with Uber Eats! How much does merchandising pay? Merchandising pay will vary depending on who you are doing merchandising for, but it's generally anywhere from $8 to $20 per hour. Some merchandising companies will additionally reimburse you for your mileage. This is especially important if you are having to travel a good distance away from your home to do the work. Is it OK to do merchandising for more than one company? Yes, you can certainly work for more than one company. But it's important to be mindful of things like store location and the amount of work involved. For example, let's say you accept two merchandising jobs for the same day. However, the stores are 30 to 40 miles apart from each other. That may not really work out for you because of all the driving. So, don't immediately accept every job you're offered. Sometimes it pays to be selective. If you're going to take on multiple merchandising jobs, try to make sure they aren't too far apart. Do you have to have experience to be a merchandiser? Some companies would prefer that you have a background in retail, but many will hire you regardless. 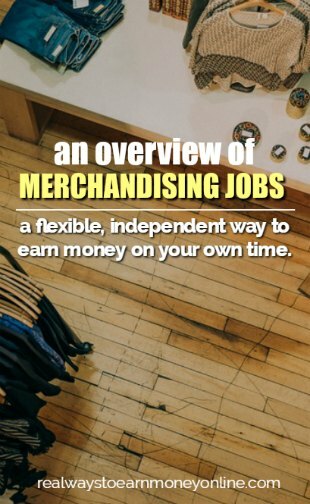 Once you land the first merchandising job, you can use that experience to get more work. You might find it easier to get more jobs after you've got a few under your belt. How do you get started merchandising? To get started, you need some good sources for finding the merchandising opportunities. Manufacturers will post the opportunities and how to contact them. You can apply, and if they are interested, they will contact you. I highly recommend visiting Volition.com's merchandising forum for current job postings. Looking for other flexible opportunities? If so, you may want to check out Uber Eats. They are currently in need of people to deliver food orders nationwide. You can drive anytime you want and do the deliveries from your car, bike, or even your scooter. I have appied to many merchandising companies. I was not called for an interview. I have six months cashier experience in a restaurant. I also have 6 years mystery shopping experience.Do anyone know of any merchandising companies that hire those without experience. Should I leave out non related jobs on my resume? I work in law enforcement. Hi Hope, I am honestly not sure since I haven’t applied for these personally. But they all appear to be legit companies that regularly need merchandisers. I hope that you get some calls! I worked as a merchandiser for two and a half years for one company. For the most part I loved my job (I quit so that I watch my grandchildren when my daughter returned to work). Your article left out several important aspects of the job. Most assignments are solo and you need to be able to work with the store managers in order to complete the assignment’s. Bigger resets are usually team projects and if you are team lead you are responsible for what the rest of your team does or doesn’t do, along with making sure everyone’s time is reported for payroll. Some companies will assign you to service the same stores on a regular basis, which makes it nice when you get a good rapport with the store manager. But some store managers can be extremely difficult to work with. The company I worked with (Driveline Retail) payed by the hour, but it seems they don’t like to give raises. The best part was that as long as my supervisor had ample time they can reassign an assignment with no questions asked. Thank you so much for this additional insight! I know it will help others who are considering this line of work. I’m looking at the different merchandising companies.0 I’m signed up for Marketforce while back ago but haven’t done any merchandising with them just a few mystery shops. Which companies have you all actually done merchandising for? Which companies do you all reccomend? There are so many to chose from not sure where to start. Great list! I come across the occasional product merchandising job, but this list is a great place to get started, if you’re seeking a work-from-home job in that area. Great Article Anna! Thank you for the mention. My husband and I both do merchandising periodically and a trend I am noticing with a lot of the companies is many of them are hiring on as W2 status for insurance reasons, but the work with most is still very assignment based and merchandisers can still work for other companies. Thank you Carla! I appreciate the compliment 🙂 It’s actually thanks to your suggestion that I’ve been putting more lists in my posts. Your article’s a real treasure resource! The list you have for companies who hire merchandisers is more than enough for a beginner to work on. Very helpful. Thanks, Sheila! I’m glad you found it helpful!